How fun is this bow? Who doesn't love Peanut Butter and Jelly? Fun Hair Bow in Lavender and Tan with printed ribbon and embellishment. Great for toddlers and school age girls! This bow is made from several layers of grosgrain ribbon and a bottlecap embellishment. 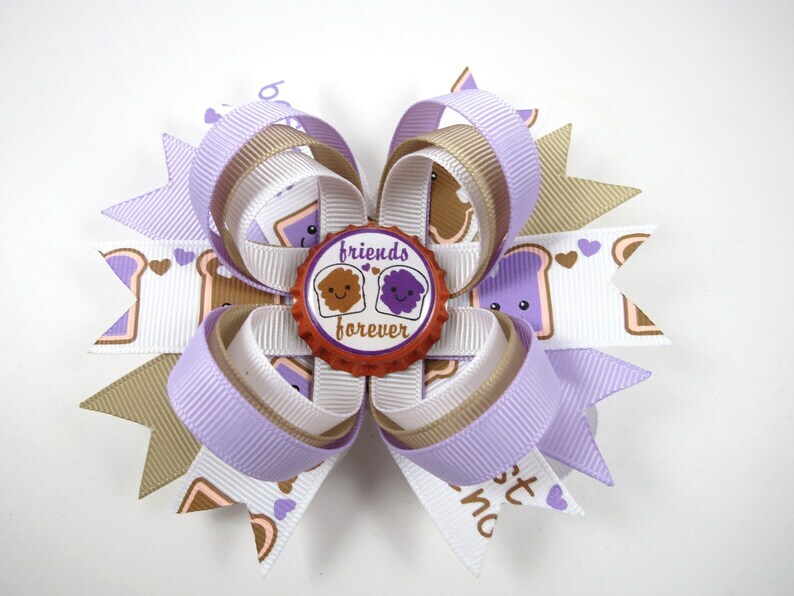 Starting from the bottom layer this bow has lavender, tan and peanut butter and jelly printed ribbon spikes. Next, there are loops made from white, tan and lavender ribbon. In the center a bottlecap has been added that says "friends forever" and a slice of bread each with PB & J on it!! This bow is attached to a partially lined alligator clip. All ribbon ends have been heat sealed to prevent fraying. Bow measures approximately 4 1/4" at the widest points. Need a headband to attach this clip to? Check out my other listings for headband options! 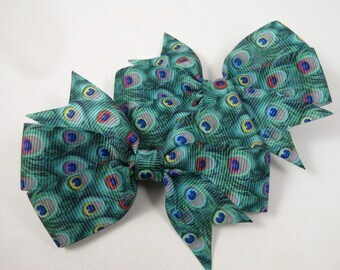 All my bows are made with alligator clips which can be attached to woven headbands. Simply open clip and silde into the woven part of headband! Don't see the headband you were looking for...just message me and I can make/list a custom item for you!